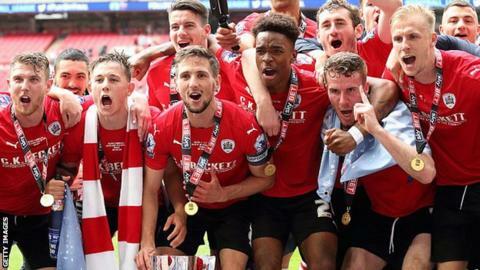 A consortium including a Chinese billionaire and the baseball boss who inspired the Hollywood film 'Moneyball' have taken control of Barnsley. Chien Lee is joined on the Championship club's board by baseball pioneer Billy Beane, as well as investors Paul Conway, Grace Hung and Neerav Parekh. The takeover ends Patrick Cryne's 13-year spell as owner. Cryne, who has terminal cancer, wrote a letter to fans in September to say he was "living on borrowed time". Chief executive Gauthier Ganaye told the club website: "We would like to thank every member of our loyal fan base for their patience and continued support over recent months. "An exciting chapter is opening for Barnsley Football Club and we are looking forward to the future together." Former Oakland A's general manager Beane pioneered the 'Moneyball' model for using computer-generated analysis to inform player recruitment and tactics, while Lee is also co-owner of French Ligue 1 side Nice, who reached the play-offs stage of this season's Champions League. He was previously linked with Middlesbrough, Hull City and Brentford before turning his attention to Barnsley. The Tykes are 20th in the Championship, four points above the relegation zone. "Barnsley fans have been waiting for a breakthrough on this takeover and they will welcome this news. "The plan, with Billy Beane involved, appears to be to develop a plan already installed at Oakwell. Investing in young players is their vision, giving them an opportunity. It's a blueprint other clubs have started to copy. "It's also expected that head coach Paul Heckingbottom is going to sign a new contract. If that is confirmed in the next few days, it'll cap a great week for the Reds."